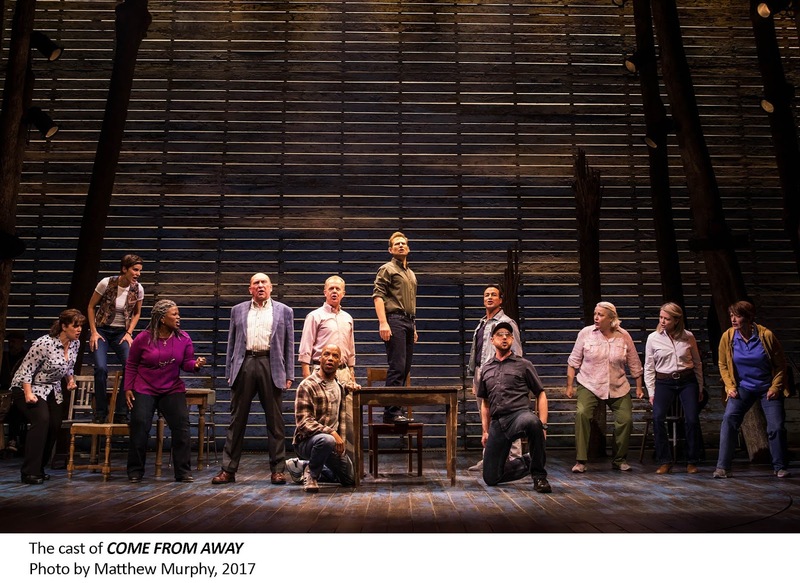 This most unlikely premise for a musical -- how the residents of Gander, a small town in Newfoundland, took in nearly 7000 diverted airline passengers (that number roughly equal to their population) on September 11, 2001 -- comes up a likable audience pleaser thanks to an engaging, versatile cast, clever staging, and eight superb musicians. 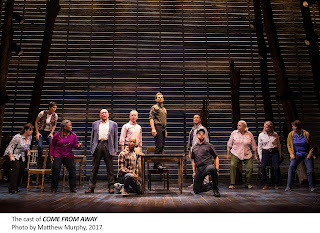 Heartwarming, albeit somewhat predictable, “Come From Away” -- which comes to Broadway via the La Jolla Playhouse, Seattle Repertory Theatre, and Ford’s Theatre -- moves briskly over its one hour and forty minutes (played without intermission), and the cast alternates effortlessly between playing townspeople and plane people. Thanks to their skill and Christopher Ashley’s ingenious direction (in tandem with Kelly Devine’s musical staging), you rarely lose track of who’s who. The book, music and lyrics are credited to the husband and wife team of Irene Sankoff and David Hein. Though the songs (mostly ensemble numbers) work effectively in the context of the show, there’s nothing particularly memorable, at least on first hearing. The story is interesting, and might have been just as effective in a straight dramatic version. Certainly, given the current political climate, the story of people warmly embracing a host of foreigners, no questions asked, generates comforting reassurance about human nature, even as the one Middle Eastern character is initially greeted with suspicion and hostility. August Eriksmoen’s orchestrations and Ian Eisendrath’s music arrangements emphasize the Celtic quality of much of the score, especially a rousing dance number in a pub. The cast of 12 work as a true ensemble, and all are excellent. There’s Astrid Van Wieren as Beulah, head of the Gander Legion, who coordinates the crowds at the local school; Chad Kimball and Caesar Samayoa as a gay couple from Los Angeles, the first, head of an environmental energy company, the other his secretary/boyfriend; Sharon Wheatley as a Texas divorcee and Lee MacDougall as a British engineer who falls for her; Jenn Colella as American Airlines' first female pilot (given the show’s only solo showstopper “Me and the Sky”); Q. Smith as a mother desperately trying to get news about her firefighter son back in New York; Joel Hatch as the town mayor; Petrina Bromley as an SPCA head distraught about the welfare of the animals on board the flights; Kendra Kassebaum as a novice TV reporter who earns her stripes during those tumultuous days; Rodney Hicks as a skeptical black New Yorker who learns to trust; and Geno Carr as a Gander police constable (one of only two). All of them deftly play multiple roles. Beowulf Boritt’s set design, lighted by Howell Binkley, has the requisite versatility for the quick scene changes from Gander cafeteria to plane to whatever. Twelve chairs are actually the principal props. Toni-Leslie James’ costumes greatly help define the characters. Gareth Owen’s sound design seems to me rather overloaded, and not all the dialogue or lyrics are intelligible. The opening ensemble number “Welcome to the Rock” got things off to an off-putting start with a particularly high decibel level and muddy quality. 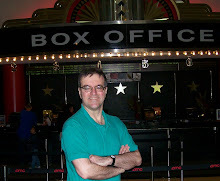 Ian Eisendrath’s music supervision keeps things lively, and when he and his fellow musicians have the stage to themselves after the cast's curtain calls, allowing the audience -- some genuinely moved to tears -- to exit the theater in a jubilant mood.